Acne scars can be disfiguring and embarrassing for those who suffer from them. It’s like wearing a badge on your skin telling the world about your battle with acne. Unfortunately, there is no makeup in the world that can correct deep, pitted acne scars to the point of making them disappear. 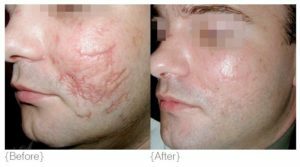 Platelet rich plasma (PRP) treatment is a procedure for correcting a number of skin conditions – including acne scarring– by using the healing properties of a patient’s own blood. Also known as the ‘vampire facial’, PRP has become popular through its promotion by celebrity figures as a less-invasive alternative to laser and surgical treatments. It is most effective when combined with other skin rejuvenation treatments, such as Micro-needling. In PRP treatment, we inject a concentrated solution of platelets taken from the patient’s blood, into the affected area of skin. Platelets are a natural component of blood, essential to the process of healing and growth of new skin tissue, particularly collagen and elastin. When your platelet-rich blood is injected back into your skin, it stimulates this healing process and helps your skin to repair the damage caused by acne scarring. At the start of the PRP procedure, we draw a small amount of blood from your arm. The amount of blood drawn depends on the type of treatment you are having, and with acne scarring, the number of scars you are having treated. We then put the blood into a centrifuge, which separates the platelets from the white and red blood cells. This part of the process takes just a few minutes. Finally, we inject the platelet-rich serum into the areas of your face with the acne scarring. When Can I See Results from PRP? Some plumping of the skin can be seen immediately. For full results, expect up to three weeks to pass. The number of treatments varies by patient. Typically, one to three injection sessions are recommended. Each treatment should be spaced four weeks apart. Your therapist will discuss your treatment plan with you during your first visit.